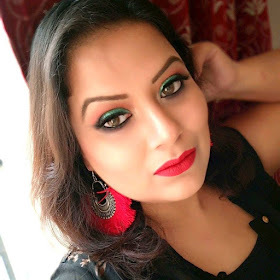 After reviewing the newly launch Avon Glimmersticks brights in cobalt cool here I am up with another product of Avon and this time it is a lip liner…yes, Avon ultra color lip liner in deep plum that I got from Avon for reviewing purpose. Avon claims these ultra color lip liner are looks freshly applied for hours. They are light weight formula and define lips without smudging. Coming to the packaging first, Avon comes in a nice sleek twist up packaging in which it holds 0.25g of lip liner which is quite enough to use for months. The texture of the lip liner is really smooth. No tugging or pulling of lips while applying the lip liner. But what bothers me a bit that lip liner after few minutes of application turn my lips dry a bit. I generally use lip liner as the base of my lips before applying the lipstick so this might be the negative point of the lip liner. The lip liner is really good in pigmentation and nice color pay off. As it comes in a twist up packaging so no sharpening require and hence less wastage of product. The shade deep plum looks really nice when swatch on my hand but when applied on my lips it look bit scary for me so I avoid posting lip swatches here as I don’t want to scare my readers. The shade is really beautiful but my skin tone never goes with plum shades , it look vampy on my skin tone so I always use it to just sketch my outline of lips but medium to dusky skin beauties can carry the shade pretty well. The deep plum is true to its name. Over in all Avon comes up with a pretty plum lip liner that are nicely pigmented and decently priced. Here are the pictures of the swatches of the lip liner. I am using true red. I had used their black liner and loved it. I am also using their Navy Blue liner which I am so loving!